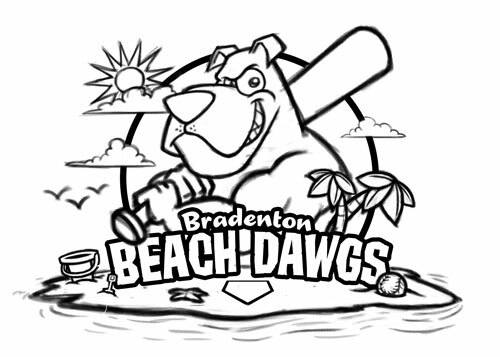 This cartoon logo featuring an athletic dog with a baseball bat was created for a little league baseball team, the Brandenton Beach Dawgs. The client was pretty open-ended about the design, save for wanting the dog to have the bat over his shoulder (or at least some sort of baseball bat in the artwork). We went through quite a number of variations before settling on the final design. The sketch below shows some of the excluded elements we tried in other concepts, such as the palm trees, and birds, sun and clouds in the background. These even made it to the vector art stage, but we decided a more simpler design worked best.